Which Eagles Are Keepers For 2013? I hope we're all on board with the fact that there's going to be regime change in 2013. To that end, I'm pretty disinterested in the results this year — excepting what we can learn that will help the Eagles move forward into the next era. A large part of that is discerning which players are expendable and which are the cornerstones for a new foundation. When Andy Reid arrived in Philadelphia in 1999, he made those hard choices. He picked the players who would make the transition. That included stalwarts like Tra Thomas, Duce Staley, Brian Dawkins, Jeremiah Trotter, Troy Vincent, and Bobby Taylor. They helped form the backbone of a team that would reach four straight NFC championship games. Most of the rest of the roster, however, was gutted and rebuilt through the draft and a few key free agent signings. Building Blocks: Players who the next coach should build the new era around. Use a scheme that plays to their strengths. LeSean McCoy. 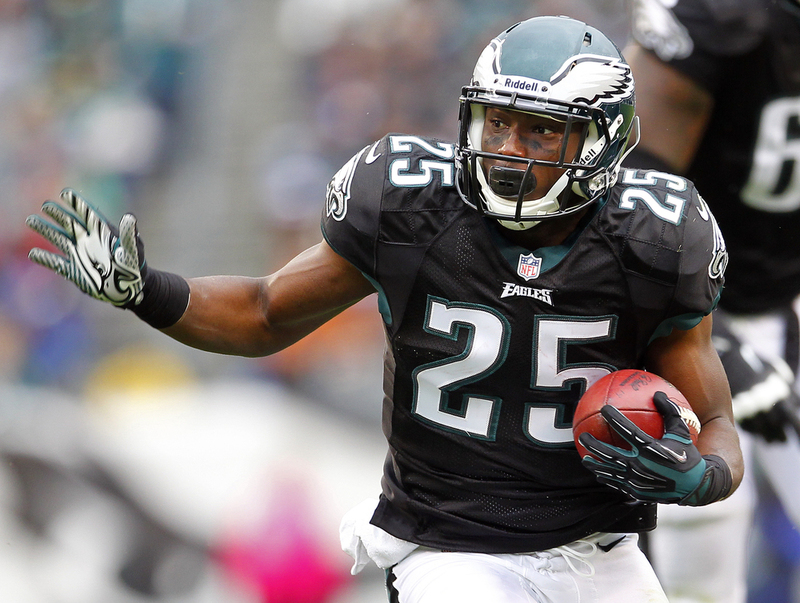 Shady should be the crutch for the Eagles' new quarterback. DeSean Jackson. New contract has re-energized him. Hasn't dropped a pass all year. Brent Celek. Turns 28 in January. Has taken a lot of hits, but keeps on getting up. Fletcher Cox. Still adjusting to the NFL, but early results look great. DeMeco Ryans. Glad to be wrong about him. Has provided leadership and consistent play in the middle of the defense. Only turns 29 in July. Keepers, With A Caveat: Players who could be building blocks, but we need to see a little bit more. In other words, hold that contract extension for the moment. Jason Kelce. Potential as rookie starter, but need to see recovery from injury. Also, may only fit certain schemes. Brandon Boykin. Upside less than other defensive rookies, but has held his own so far. Nate Allen. May have reached ceiling of "solid player." Worth something in NFL, but how much? Jeremy Maclin. Lots of talent, but Reggie Brown-esque career arc so far. Lackadaisical effort, annoying complainer. Might want more money than he's worth. Alex Henery. Still haven't seen that huge leg we were promised. But young and accurate from short distances. Dominique Rodgers-Cromartie. Top talent and style, but questionable dedication. Can be shut-down guy outside when he wants to be. Tryout Candidates: May have shown some flashes, but nothing special yet. Have to play their way onto the roster in 2013. Nick Foles. Keep your expectations low. Up to him to show he deserves a shot at starting job. Bryce Brown. Has all the athleticism to be a NFL back. Needs sophomore jump. Stanley Havili. Better than anticipated this year in limited action. Riley Cooper. Special teams performer, but rarely shows up on offense. Damaris Johnson. Exciting jitterbug who needs to play with more smarts. Clay Harbor. Looks like a fine backup tight end. That's not worth much. Brandon Graham. Great pass rush in limited snaps this year. Hasn't lived up to 1st round pick status. Philip Hunt. Great preseason, disappeared when the lights came on. Cedric Thornton. Clearly some potential. Can he perform in a different scheme? Vinny Curry. Rookie hasn't gotten on to the field. Akeem Jordan. Backup linebacker, special teams starter. Brandon Hughes. Played OK for a backup. That's probably his ceiling. Kurt Coleman: Perfect third safety. Limitations (athletic and otherwise) make him a below average starter. Colt Anderson: Kick coverage star looks lost on defense. The Oldies. These players are riding close to the expiration date. May be starter-quality now, but will they be when the rest of the team is ready to compete again? Michael Vick. Will be 33 before next season. We've seen the limits of his game. Time to find a new franchise QB. Jason Avant. Turns 30 in April. Numbers are down this year. Jason Peters. Turns 31 in January and recovering from major injury. Elite athlete could shore up LT for a few years, or he could be done. Todd Herremans. Will also be returning from injury. At 30, his play dipped this year. Evan Mathis. Best remaining lineman for the Eagles doesn't mean much. 31 years old. Jason Babin. Production fell off a cliff. Will be 33 in May. Trent Cole. After contract extension, only has 1.5 sacks so far in his age 30 season. Mike Patterson. It's amazing he's even playing after brain surgery. Cullen Jenkins. Salary cut last offseason. Little reason to keep him this time. Nnamdi Asomugha. Can't cover deep. Period. Jon Dorenbos. He is only the long snapper, so I guess this isn't such a problem. Free agent in 2013, though. Get Out Of Town: I actively don't want to see these players next year. Demetress Bell. No words necessary. King Dunlap. Allergic to finishing blocks. Danny Watkins. Maybe I should have put him in the "Oldies" category. Dallas Reynolds. Not good enough to be a backup center. Derek Landri. Very inconsistent player, never performed at all outside the Wide Nine. Jamar Chaney. My feelings on this subject are well documented. Mat McBriar. How hard is it to find a real punter? Don't Care: I feel nothing toward or against these players. At most they get a tryout. Trent Edwards. Third QB at best. Dion Lewis. Hasn't shown much of anything worth hanging on to. Chris Polk. I don't know why he's on the roster. Dennis Kelly. Looks about as bad as Watkins. Darryl Tapp. Middling veteran backup. Nothing more. Casey Matthews. No redeemable qualities. Curtis Marsh. 29 defensive snaps in one and a half seasons. Tagged with Head Coach, Brent Celek, Coaching, 2013, Philadelphia Eagles, NFL, Roster, DeMeco Ryans, Andy Reid, DeSean Jackson, Fletcher Cox, Mychal Kendricks, LeSean McCoy. November 12, 2012 by Brian Solomon.